Noise-induced hearing loss is deafness caused by high volume noise. Sufferers may lose the ability to perceive a small number of frequencies. Alternatively they may have damage to their ability to perceive all sound or they may develop tinnitus. Deafness may come on over a long period of time from small repeated insults to hearing. This can happen with loud music, industrial or ambient noise. Otherwise, hearing can be lost secondary to one high energy sound wave such as that which is generated by an explosion or lorry tyre bursting. Damage occurs due to overstimulation of the nerve cells which detect sound. This results in their reduced function or death. There is no way of restoring the capacity of the cells once damaged. Occupational hearing loss is deafness resulting from individuals being exposed to noise at work. This is far less common than in the past due to the advent of health and safety law and personal protective equipment (PPE). Many people are aware that exposure to loud noise can cause deafness, but it is not as widely known that tinnitus can also occur. Severe tinnitus can affect hearing, but it also has a severe impact on sleep and can lead to depression, anxiety and insomnia. Reduce noise volume. The first approach to reducing the risk of occupational hearing loss is to tackle the volume of noise in the workplace. Isolating noisy equipment and updating working practices make a huge difference. Maintaining machinery can also help to reduce noise levels. Reduced duration of exposure. If noise is unavoidable reducing exposure will reduce the risk of noise-induced hearing loss. Frequent breaks, staff rotation and reducing the need for staff presence in noisy areas will all reduce the risk to the individual. Wear moulded PPE earplugs. 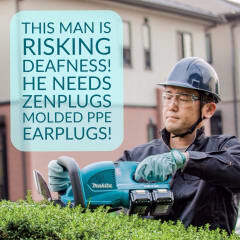 ZenPlugs Moulded PPE Ear Plugs are individually fitted to the ears. Made from a kit, they give comfortable, long-lasting, antibacterial ear plugs. PPE compliance will be higher in the workplace as they are much more comfortable than foam varieties. The SNR is 22 and ZenPlugs are the only ear plugs in the world which are healable if damaged and can be remoulded as often as you need. Once hearing damage has occurred hearing aids and cognitive therapy may help but will not remove the problem. NIHL occurs from unsafe levels of noise in residential, military and recreational environments. It can also occur in occupational and social scenarios. Many people regularly expose themselves to dangerous noise levels. This is whilst listening to music on portable music players and concerts and festivals. Conclusion. Noise-induced hearing loss is a syndrome of deafness and tinnitus secondary to noise. It can be prevented by reducing noise volume, exposure duration and wearing PPE ear plugs.